We are a little way into 2014 and with a few races under my belt to blow off the winter rust, here is a update on my 'progress'. In October 2013 we set up CuroSeven.Ltd. a company which offers proactive health consultations and performance optimisation through physiological analysis. (Blood/Saliva testing). It has been an exciting time with much interest in the service but also a busy time. Training to race the best pro athletes in the world cannot be undertaken half heartedly and this is something that most age-group and some pro athletes will understand. I average around 16 hours a week training - many pro's train for double this time. If you have to work between training sessions, your recovery both mental and physical can be compromised. Have a read here if you are interested in more about this. The crux is don't do your quality - hard sessions when you have had a mentally challenging/stressful day. Caffeine seems to prevent the decline in performance seen with mental fatigue, but then recovery and adaptation may be affected if the workout is in the evening. Interestingly caffeine tends to be performance 'enhancing' in the morning but not pm. Race 1 - Challenge Fuerteventura. If this race has been 2 weeks earlier I would have been confident about my ability to fight for the top spots. I had my best ever training camp with coach Tom Bennett at Ferrer Hotels in Mallorca. But as is often the case when things are going well, i noticed a niggle towards the end of the camp in my peroneals which was revealed by a timely ultra-sound scan (thanks @ParysEdwardsTri) to be a peroneal and calf tear. Lesson - Don't change cleats (from SpeedPlay back to Shimano and fiddle incessantly with the position..) Constant microtearing of the muscle has resulted in a significant tear all the way along the peroneal border and part of the soleus muscle. Result - 8 days no running pre race. This race is held out of Playitas Resort which many Pro Athletes use as a winter base - hence a stacked start list with multiple IM and 70.3 winners. Performance on the day was decidedly average. I missed the pack in the swim and swam alone - need to work on the first 400m acceleration - as being a one-paced wonder - does not cut it. Goggles got kicked off - so Sighting was interesting. Bike was ok, but perceived effort was higher for the power that i was hoping to push and my calf injury niggled with each pedal stroke, mentally undermining my race head. I made up some of the lost time on the swim but had hoped for more and came into the T2 in 4th. I went out tentatively as I didn't know how the leg would feel. Any sharp pain and instructions were to stop - no sharp pain and I jogged on. And this is how the run went - no digging deep, no fighting for the podium - just a run which didn't tax my injury and which may have had been sidelined from upcoming races. Eimear Mullan whom I have battled with in races before - came through with a storming run to run through from 6th to 2nd, with only Camilla Pedersen remaining ahead. Read more about Camilla's incredible return from coma to racing here. To put it in perspective I ran a 1.30 half marathon which is often what my long sunday runs end up being. (Coach says I am over-striding in this photo btw. First race done, dusted and onwards. I know it looks odd, but it has worked for me in the past. Reason - 2 x collar-bone breaks means that I have restricted range on that side - even the most flexible wetsuit affects my ability to get into a high elbow catch - this helps, but downside is water gets into the suit - meaning more drag. I have tried to get hold of the sleveless wetsuit, but availability is low. all went out hard from the gun. Liz Blatchford as a former ITU athlete and super swimmer immediately got ahead with a few perfectlly executed dolphin dives. I swam with Lisa and Sophie alternating position for most of the way until we caught some of the slower male pros who then tried rather viciously to usurp my position and i lost feet, got dunked and had to swim wide to get clear. I exited T1 around 20secs behind this group and a few minutes behind Liz. Game on. On to the Bike, legs felt good from the start which is rare for me and I pushed ahead on the road through Pollenca - catching Sophie, Astrid Ganzow (Also a Doctor who won her AG in Kona last year.. ) and Natasha Schmitt. Then in the lead into the climb I started to get a cramp in my calf ( the healing injury_) and my watts dropped as I tried to stretch and offload it. Not too bad and back on it quickly. The girls came past me once more at this point and we went onto the climb together. I had instructions to cap watts on this climb (sub threshold) and I did... but suprisingly the others were pushing hard all to'ing and fro'ing. I kept them in my sights but didn't attack, biding my time. Over the climb and onto the descent which I have done countless times. I am descending well this year, thanks to some practice and learning how to place weight appropriately on the pedals when cornering. Thank you to http://ulrichscherbaum.wordpress.com/ for the photo. I do, however, have the tiniest tri bars which can make handling somewhat interesting. Through one of the last corners on the descent and a Goat came out of the blue - trotted onto the road - i could see it perhaps 20m away. It stopped - seemingly assessing my intentions - and then aborted its crossing the road mission - and ran back the way it came. I had gambled on it continuing to cross so swerved that way to avoid and then narrowly missed hitting it as I came off the side of the road. This was all a blur which I did not remember until hours after the incident when I slowly started to replay the event in my mind. I had hit my head hard, as my helmet showed, but aside from feeling dizzy and nauseas (it will pass - I told myself as I got back on the bike... - i was roadrash free (body landed on the verge - head on the concrete)..
ARE YOU STILL WITH ME?? Back on the bike - steady - steady - as I was turning onto the road to Campanet some time later my vision started to blur and i kept nodding my head to bring it back... then more dizziness.. then I vomited. A race motorcycle who had seen the fall, kept me in its sights and as I was they pulled up to me and told me to stop. Seeing sense - I did, got off the bike, sat down, still shaking and vomited again. An ambulance was called - which arrived in what seemed seconds, and soon I was in Inca Hospital. Tides of emotion came as I lay in a cubicle in the hospital with a drip and heart monitor attached. I am not one to cry normally, but I couldn't stop the tears. Frustration, disappointment, self-blame/pity you name it. All augmented by the wails of clearly unwell patients nearby. Its a powerless feeling being the other side of the fence in a hospital, waiting for the medics to pass by, make decisions and the very atmosphere of a hospital makes one feel infinitely more sick than one may actually be. I was kept on a heart monitor as my initial ECG showed Large T Waves - common in some athletes - but not common in the general population and also a few ectopic beats. A look of concern on a doctors' face is always invokes apprehension, but i assured her that I was feeling ok, just a slight headache and persistent nausea. I was advised to stay and I did as I was told for 4 hours (no mean feat ;) . Blood tests and a skull xray ruled out rhabdomyolysis (muscle breakdown which can cause kidney failure) and a fracture. I was diagnosed with concussion and told to take it easy. The days post crash were similar - I felt a bit battered, heavy and with a lingering headache. My hip was bruised and a little swollen, but otherwise not too bad. By Wednesday, I started to consider the possibility of putting my goat demons to rest and approached Ironman to ask if I could race Ironman 70.3 Barcelona. I was told it was too late to arrange entry, so tried a second option of Ironman 70.3 France, where I have raced twice before and know the organisers. Thursday they agreed to arrange entry, and I booked flights to arrive Friday. Friday morning arrives - I wait at the airport for my 'Meet N'Greet' to pick up my car. 20minutes later than scheduled he arrives and I race to the checkin desk only to be informed that they could not accept my bike 45mins pre flight. No other option - Can't board - must reschedule. Told reschedule would be the same time Saturday.. and a million thoughts go through my mind - I have never arrived to a foreign race the afternoon before - and the logistics of the race in France with a T1 30k away from T2 means it would not be an easy pre-race day. I agree and I fly out on Saturday. At least I know the course. Hastily build bike - no mechanics on site to check it over and I could feel my rear derailleur was out after a quick spin - tried a Di2 reset - it did something but didn't quite fix it. A Few hours of sleep stolen. Does anyone ever sleep well before a race? I can guarantee I will look at my phone clock every hour from midnight until the 5am alarm. Struggled to get my breath... panicked (its been years since this has happened). Stopped pulled at wetsuit around my neck..
a few diaphragmatic breaths and self reassurance.. heart pounding (your heart is fine Tam...) onwards. Got into a rhythm and swam alone. I'm in a funk with my swim at the moment as have changed from a six beat kicker to a 2 beater. it helps with my rhythm/balance - but in a wetsuit - I'm so buoyant I don't seem to get much out of the kick at all - hence accelerating/changing speed is difficult. Onto the bike ... Game on.. Head down and Aero. Damn forgot to look at the road and a newly built speed bump. Bang - am on the ground again. Chain lodged against frame -- pulled it out - sliced hand (a g a i n ) picked up bike .. jumped back on. Gears slipping noisily from the outset must have hit derailleur and back wheel as brake now rubbing. Got off - rectified wheel position - but another Di2 reset did nothing for my gears. Make Do - Just Make Do. I caught a few girls and a cursory look from Jeanne Collonge at my bleeding hand and she asked if I was ok. Sweet. We would ride together legally for a while... Jeanne pulling ahead slightly on some of the climbs (usually my strength but Jeanne is one of the best climbers in the sport - having won Embrunman - an Ironman with over 5000m of climbing).. and me catching and passing on the descents and flats. My gears continued to slip throughout the ride - you could hear me coming! But I felt relatively strong. My Tri Bars and Saddle had slipped as I went over the speed bump, meaning my position was less than ideal - it was all less than ideal - but thats racing - you roll with the punches. 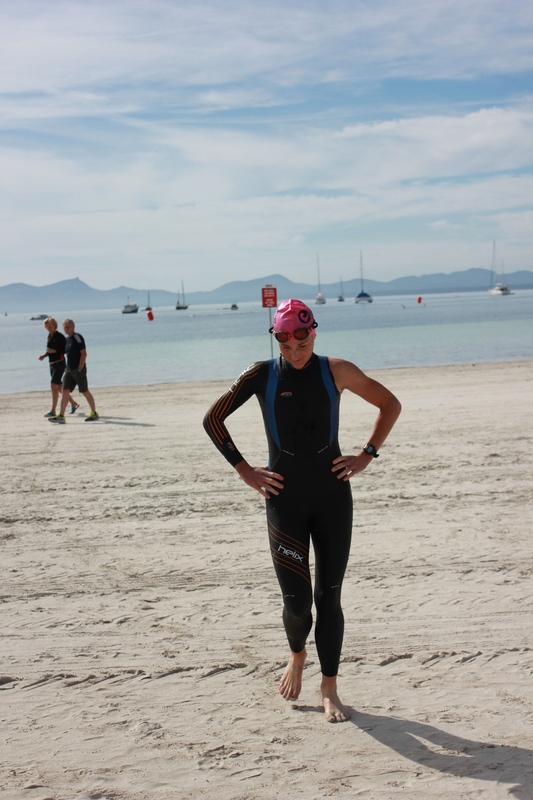 Into T2 with Jeanne in 3rd behind Tine Deckers (who had swam well).. and the incredible (how many Ironmans?) Gina Crawford. Onto the run course and within 5 minutes I get a stop and go penalty for not having my number belt round the wrong way - this has never happened before - perhaps a warning - but no messing - yellow card.. I used the opportunity to go for a much need pee. It is 'illegal' to pee in public on the course, but many can and do pee whilst you are running. But there were a lot of marshalls and regular Vitamin B consumption means bright yellow conspicuous pee. Some days you get on the run and know its going to be a good 'un. Other days legs won't do what the body wants them to. This is where fuelling on the bike comes in. Because I avoid refined carbohydrates as much as possible my gut really doesn't take kindly to an attempt to take 5 gels on the bike. They say train your gut to be able to tolerate and absorb carbohydrates but I'm just so put off by all the negative sugar press... that the thought of taking on 2-4 gels an hour on a training ride doesn't happen. I do 'drip feed' carbs on training rides.. but nothing like the 60+g an hour which evidence suggests improves performance on race day. (if tolerated, i.e no GI effects). I ALWAYS take Buscopan on the bike as well as Omeprazole 20mg pre race to limit GI side effects. They are tried and tested and work, as do Charcoal tabs (reduce bloating and nausea) - but race nutrition needs to be trialled (more than once) in training - esp. if you are an age-grouper who doesn't race frequently. GI issues are amongst the most common complaints post race. I would say I am sugar phobic, but I will happily munch on chocolate (and wine) so its not quite true. Need to work on this as I may experiment more with a little MCT oil, BCAA's (may prolong exercise tolerance) as well as the carbs - but again at the intensity of an 70.3 absorption of MCT's (fats) is going to be limited. Like many Pros I empty the gels into a large 750ml water bottle and fill up with water. Vanilla Powerbar is my current gel of choice, with 10g of BCAA's. I managed 3 gels on the bike and 1/2 gel and a few sips of coke on the run. The rest was fuelled on fat stores and glycogen. My hamstring and hip were sore and i felt like I was having to lift the leg through rather than pushing off.. I see Jeanne run away into the distance (She would run a sub 1.19 run and win the race)... but had no idea where Gina, Tine or Susie (last years winner) were. I just kept truckin, feeling very blah. Then on the last lap I saw Susie (superb runner)..
closing and I thought if I could run and increase my turnover a bit I might just be able to hold her off.. She caught me on the run to win the race last year with me finishing 2nd. (Sept.).. If I could salvage something and finish ahead that would be something. Here is My Race Report from The Race Last Year. I managed it and crossed the line in a respectable 4th. Not outstanding and many obstacles en route. But testing times, often make us stronger in the long run. I am determined not to give up racing until i at least get a glimpse of a near perfectly executed race! I am still deciding on upcoming races. Ironman Nice is still on the Agenda.. but time to put the nose to the grindstone again and re-balance my training/work schedule. Exciting news that my new bike - Felt IA has arrived at Pearson Cycles! Thai Adventure - Part 1. This is my 3rd year returning to Laguna Phuket in the South of Thailand, and each year the trip unveils new and exciting experiences. Thailand is one of my favorite places in the world. The oppressive yet relaxing humidity, the warmth of the locals, the cacophony of food flavours.. Racing in early December when you've been racing since March, is a little ambitious, but on discussion with my coach Tom Bennett, I knew I couldn't miss out on the first year that the Laguna Phuket Triathlon became the Challenge Laguna Phuket Tri-Fest. I arrived in Thailand 2.5kg over race weight (its cold in the UK this time of year and I always put on a bit of fat insulation in the winter ;) and far from the cardiovascular shape that i had earlier in the season. I have been focusing on setting up my new business CuroSeven as well as working a few locum shifts to pay the bills. Training was quality but half my 'normal' training volume. I was unsure how I would fair in the races, but i had faith in Tom that I would be 'just fine' come race day. The bonus was - I arrived 8 days before the first race so time for some acclimation. Plus having raced in these conditions (Heat: 33C & 90-98% humidity) before, the body remembers and re-acclimation is improved. The organisation is superb for this event (Thanks Roman Flosser!) and as the event is sponsored by Laguna Phuket holiday resort, some of the returning Pro's are treated to 5 star luxury hotels. Its the reason Multiple World Champ Melissa Hauschildt returns year on year too, and being an Aussie its a quick hop over the ocean. Unlike many other top Pro's who race this event year in year out, Mel is always in good shape. (Has she ever even had a bad race?) Ironman World Champ Pete Jacobs toed the start line this year, along with a very out of shape Macca (I actually thought I might chick him ;). I started my stay in Thanyapura which is an incredible facility about 20 minutes from the race location. I have stayed here each year and seen its growth and development over this time. I was very excited to hear that Chris McCormack was appointed CEO in recent days which will serve to develop the facility and its use as an international training ground over the coming months/years. Macca is also keen to set up an International Professional Racing Team - watch this space! Former Pro Triathlete Jurgen Zack famous for his uber strong biking has been based out in Thanyapura for years and is credited for the growth of the triathlon scene in Asia. As a team doc to the MaccaX Triathlon Community I work closely with Chris and am passionate about the growth of the triathlon community. Macca's influence on the growth of the sport of triathlon internationally is remarkable. Personality he is. In week 1 I helped out with Ben Greenfield's camp which was based at Thanyapura. I have known Ben for a while, and I admit, initially I was a little skeptical of his 'credentials' and marketing hype. However after talking to him in person and listening to his podcasts, it became obvious that he is extremely well read/educated and a complete perfectionist in many aspects of his life. For someone in his early 30's, he is incredibly successful and 'self-made' - heading up a number of his own businesses, whilst competing as a top-level amateur triathlete (Kona x 4) and home-schooling his two adorable twins. Worth listening to a podcast with him interviewed by Rich Roll . Ben has a religious following and some of this 'biohacking' tips and tricks are addictive! The camp was superb - busy - with a big focus on technical skills and interactive talks. See some of the pics from the camp here. Thanyapura also offers physiological and blood testing so I was able to use my CuroSeven skills and put some of the camp attendees through testing. Many were surprised at their results. Ben himself regularly gets tested and blogs about his blood test reports and what you can learn from them. See here. - as WellnessFX is only available in the US, we set up a similar (albeit much more niche service) in the UK so that anyone interested in taking a proactive stance on their health can benefit. In the week leading into race 1 - LPT 1.8k swim/55k hilly bike/12k run - I got hit with some form of GI (gastro-intestinal) bug. I could barely eat anything without feeling or being sick and I had to make sure i was never far from a toilet. The Thursday before the race, I stayed in a dark room, sipped coconut water (osmolarity very similar to human blood plasma, hence highly functionally hydrating)... and prayed it would pass. At this point i was one of the only ones who was unwell, but by this time next week, there were nearly 50 people who reported varying symptoms. Two people were hospitalised with severe dehydration and intractable vomiting. It is difficult to know what caused this high rate of illness. It was not 'food poisoning' as many thought, in my opinion as onset of symptoms were delayed and people were affected in different hotels, eating different meals. Turns out that heavy rainfall/flooding - as often happens in Thailand this time of year - and certainly did this year - facilitates water borne and vector borne infectious illnesses. So even small amounts of water ingested can cause gastro-intestinal (gut) infection as the water - sea and laguna/lake water - can be highly contaminated. Ben Greenfield became very unwell and has vowed to be more prepared next time. He writes about his experiences here - "Poop-Emergency"
Add this to the fact that many athletes have weakened immune systems, especially when training hard AND the heat which increases the 'leakiness' of the gut - allowing more toxins/nasties that would otherwise be contained within the bowel into the blood stream and causing illness. Read more about 'leaky gut' here. and through Ben's podcast here. See this article for a longitudinal study on incidence of infections as related to heavy rainfall in Taiwan. * Keep your mouth shut as much as possible. * Carry antibacterial hand wash or wipes with you everywhere. * Reduce your gut 'leakiness' by taking glutamine high dose and colostrum, e.g Neovite, prior to travel and continue at this increased dose whilst in high risk areas and in the heat. * Probiotics - a quality multi-strain probiotic can work wonders for reducing risk of infection and also improving many other aspects of your health. Stay Tuned for Part 2 and 3!